2. School of Biomedical Engineering, Shanghai Jiao Tong University, Shanghai, China. Osteopontin (OPN), a multifunctional protein, is involved in numerous pathological conditions including inflammation, immunity, angiogenesis, fibrogenesis and carcinogenesis in various tissues. Extensive studies have elucidated the critical role of OPN in cell signaling such as regulation of cell proliferation, migration, inflammation, fibrosis and tumor progression. In the liver, OPN interacts with integrins, CD44, vimentin and MyD88 signaling, thereby induces infiltration, migration, invasion and metastasis of cells. OPN is highlighted as a chemoattractant for macrophages and neutrophils during injury in inflammatory liver diseases. OPN activates hepatic stellate cells (HSCs) to exert an enhancer in fibrogenesis. The role of OPN in hepatocellular carcinoma (HCC) has also generated significant interests, especially with regards to its role as a diagnostic and prognostic factor. Interestingly, OPN acts an opposing role in liver repair under different pathological conditions. This review summarizes the current understanding of OPN in liver diseases. Further understanding of the pathophysiological role of OPN in cellular interactions and molecular mechanisms associated with hepatic inflammation, fibrosis and cancer may contribute to the development of novel strategies for clinical diagnosis, monitoring and therapy of liver diseases. Keywords: Osteopontin, liver injury, inflammation, fibrosis, hepatocellular carcinoma. Osteopontin (OPN), also known as secreted phosphoprotein, was first described in 1979 , and also independently identified as bone sialoprotein , early T-lymphocyte activation-1 (Eta-1)  later. Subsequently, numerous studies have reported that OPN plays a critical role in various organs under pathological conditions. In the liver, OPN normally exists in the bile duct epithelium physiologically . In 1999, liver pathological expression of OPN was first confirmed in Kupffer cells, hepatic macrophages and hepatic stellate cells (HSCs) in necrotic areas after carbon tetrachloride intoxication, where OPN was indicated to contribute to infiltration of macrophages into the necrotic areas . In the following years, OPN was found to be involved in many liver diseases such as acute liver failure (ALF) [6, 7], nonalcoholic fatty liver diseases (NAFLD) , alcoholic liver diseases (ALD) , liver fibrosis with chronic hepatitis B (CHB) , chronic hepatitis C (CHC) [11, 12]. Furthermore, OPN was suggested as a better prognostic marker for early hepatocellular carcinoma (HCC) than alpha-fetoprotein (AFP) . In this review, we will focus on the role of OPN in liver biology and discuss potential approaches to diagnosis and clinical trials (Fig. 1). OPN is located on chromosome 4 region 22 (4q22.1) in humans and is composed of about 300 amino acids (314 in human, but 297 in mouse). The multi-functionality of OPN is due to varied post-translational modifications such as phosphorylation, sulfation, glycosylation and protelytic cleavage. OPN contains an arginine-glycine-asparate (RGD) domain, which binds with high affinity to integrins such as αvβ1, αvβ3, αvβ5, αvβ6, α8β1, α5β1 [14-17]. Next to the RGD motif is the serine-valine-valine-typrosine-glycine-leucine-arginine (SVVYGLR) sequence in humans or serine-leucine-alanine-tyrosine-glycine-leucine-arginine (SLAYGLR) sequence in mice and rats, which is exposed upon cleavage with thrombin and interacts with α4β1, α9β1, α4β7 integrins [18-20]. Additionally, another integrin αxβ2, which is neither RGD nor SVVYGLR dependent, has been reported to mediate the effects of OPN [21, 22]. In addition to interacting with integrins, OPN has also been reported to bind to the spliced variant forms of CD44, notably v6 and v7, but the specific binding domain in OPN remains elusive . Most recently, two new proteins, vimentin and MyD88, were found to interact with OPN by coimmunoprecipitation [24, 25]. Double-edged sword functions of OPN in liver pathogenesis. I/R: ischemia/reperfusion; DEN: diethylnitrosamine; TAA: thioacetamide; ALD: alcoholic liver diseases; NAFLD: non-alcoholic fatty liver diseases; HCC: hepatocellular carcinoma. In humans, OPN correlates with the degree of liver necrosis during acute liver injury [6, 7]. Patients with high serum OPN levels have a significantly poorer prognosis than patients with low serum OPN . However, very high levels of plasma OPN are associated with good outcomes . Whether OPN protects from disease progression in the setting of acute liver injury needs more investigation. In animal models, OPN usually acts as a chemoattractant for macrophages and neutrophils. In carbon tetrachloride-intoxicated and Propionibacterium acnes-treated rats, OPN contributes to infiltration of monocytes and macrophages in the liver [5, 26]. In addition, MMP-cleaved OPN mediates hepatic neutrophil accumulation in the early phase of liver injury during obstructive cholestasis after bile duct ligation (BDL) in mice . In drug-induced liver diseases, mice with both endogenous and exogenous blockade of OPN are less susceptible to acetaminophen and survive acetaminophen (APAP) overdose [28, 29]. In OPN deficient mice, neutrophil infiltration and macrophage accumulation are impaired, and release of pro-inflammatory cytokines is inhibited; yet, OPN deficiency augments CYPs genes in APAP metabolism in vivo . Similarly, upon exposure to diethylnitrosamine (DEN), another hepatotoxic drug, OPN deficiency enhances susceptibility and abrogates estrogen-mediated hepatoprotection against DEN via augmenting oxidative stress and keeping CYP2A5 expression in mice . Recently, a few studies suggest that OPN acts as a protector during inflammatory liver injury. OPN have been found to inhibit activation of NF-κB and ameliorate production of IL-6 and TNFα in macrophages, thus promoting survival of hepatocytes in DEN-induced liver injury . Likewise, in hepatic injury induced by ischemia/reperfusion (I/R), OPN in macrophages limits IL-6, TNFα, IL-1β and toxic iNOS production; meanwhile, OPN silence in hepatocytes decreases anti-apoptotic Bcl2 and ATP levels to aggravate the injury . Similar to that in acute injury, plasma OPN levels are significantly elevated in patients with hepatitis including acute hepatitis, chronic hepatitis and fulminant hepatitis [32, 33]. Transgenic mice expressing OPN in hepatocytes can develop mononuclear cell and CD8 positive cell infiltration in the liver after 12 weeks of age, and plasma ALT activity and focal necrosis in hepatic lobules increase after 24 weeks, which may be a useful model for autoimmune hepatitis . ConA-induced hepatitis mimics T cell-mediated liver diseases including autoimmune hepatitis and viral hepatitis. In 2004, Diao et al. first uncovered that OPN cleaved by thrombin enhanced NKT cell activation and neutrophil infiltration and activation to augment ConA-induced hepatitis . Later, OPN was found to interact with β3 integrin to induce IL-17 expression depending on p38, JNK, NF-κB pathways to aggravate ConA-induced hepatitis . Both silence and exogenous blockade of OPN protects ConA-treated mice from fulminant hepatitis [37, 38]. OPN production is also up-regulated in CHB and CHC patients [36, 39]. OPN is shown to improve the maturation and functioning of DCs in response to HBV antigens . Yet, in patients infected with HCV, OPN may directly promote HCV replication . Granuloma formation is a host response against persistent irritants. In β-glucan-induced hepatic granuloma formation, OPN does not affect the size and the number of granulomas, but induces IL-12 and IFNγ at early stages. Nevertheless, at late stages, OPN increases the size and the number of hepatic granulomas due to enhanced immune cells recruitment including macrophages, CD4 T cells and DCs into the liver and increased TNFα production . Otherwise, OPN neutralization reduces granulomatous response and liver damage via impaired chemotactic function and inflammatory response , which suggested that OPN neutralizer acts as the immunosuppression therapy for liver injury with granulomatous responses. We have reported that in a model of regenerating liver after partial hepatectomy (PHx), OPN promoted inflammatory response and activated IL-6/Stat3 pathway in the early phase to facilitate hepatocyte proliferation . Recently, gene expression profiling after hepatectomy showed that 81genes participating in the OPN-mediated pathway were significantly changed, 65 of which were up-regulated. All of the 81 genes were mainly associated with stress response, inflammatory response, cell activation, proliferation, adhesion and migration . Elevation of OPN in oval cell-activated regeneration is more significant than that in PHx-induced regeneration, indicating that OPN might be specifically activated in the induction of oval cells to contribute to liver repair . Under pathological conditions, OPN involves in Hh signaling and acts in a paracrine and autocrine manner to enhance liver progenitor cell response and fibrogenic liver repair during carbon tetrachloride-induced liver fibrosis and/or MCD diet-induced NASH fibrosis [46, 47]. Yet in thioacetamide(TAA)-induced fibrosis, OPN delays resolution due to sustained fibrillar collagen-I deposition and decreases hepatocyte proliferation in vivo and in vitro [48, 49]. Further investigation of OPN's role in pathological repair is still needed. Hepatic expression and serum levels of OPN are markedly elevated in patients with alcoholic hepatitis (AH), alcoholic cirrhosis and end-stage ALD [50, 51]. OPN is also progressively increased in liver fibrosis and association with the stages of fibrosis . Serum levels of OPN are correlated with the disease severity of AH patients . Otherwise, OPN deficiency mice are protected from alcohol (ethonal)-induced liver injury . Although OPN levels are not elevated in hepatic alcoholic steatosis patients, expression of OPN in a rodent model of alcoholic steatohepatitis (ASH) has been confirmed . OPN interacts with neutrophil α4β1 and α9β1 integrins, contributing to hepatic neutrophil transmigration and activation to lead to further injury in the rat ASH model . Furthermore, female rats are more susceptible to ALD during ASH, which might be due to higher neutrophil infiltration mediated by OPN . However, in some other established studies, OPN may play a protective role. OPN deficiency facilitates the development of AH from chronic ASH, which is a distinct spectrum of ALD with intense neutrophilic inflammation and high mortality, and promotes the intensity of neutrophil infiltration in the AH model , indicating that OPN is protective for AH. Ge et al. established that OPN could bind to gut-derived LPS and prevent macrophage activation, reactive oxygen, nitrogen species generation, and TNFα productionin mice fed the ethonal Lieber-DaCarli diet . Furthermore, by blocking LPS translocation in vivo, milk OPN was reported to diminish ethonal-mediated liver injury and protect from early alcohol-induced liver injury [56, 57]. In general, further investigations are still needed to clarify the function and therapeutic values of OPN in ALD. In patients with NAFLD, serum levels of OPN are elevated and serve as the independent predictor of portal inflammation . Notably, hepatic OPN expression is also strikingly increased in obesity-induced liver steatosis with CD44 and correlates with liver triglyceride accumulation . Hepatic NKT-derived OPN promotes fibrogenesis during NASH via facilitation of HSC activation and neutralization of OPN with RNA aptamers attenuates these fibrogenic responses [59, 60]. In addition, in OPN deficient mice, obesity-driven hepatic inflammation and macrophage accumulation are blocked. OPN deficiency also protects against obesity-induced hepatic steatosis via enhanced hepatic insulin signaling by promoting IRS-2 phosphorylation and preventing up-regulation of FOXO1 and its gluconeogenic target genes . Similarly, OPN neutralization decreases obesity-associated inflammation in liver and reverses transcriptional signaling associated with insulin resistance and glucose homeostasis . Hence, OPN may be an ideal target for treatment of NAFLD. Various studies have reported that OPN secretion or hepatic OPN expression predicts severe degrees of fibrosis in patients with HBV or HCV infection, ALD, or schistosomiasis mansoni and might serve as a prognostic index for the progression of hepatic fibrosis to cirrhosis and HCC [9, 10, 12, 63, 64]. Hepatic OPN expression correlates with TGFβ expression, portal space neutrophil related inflammation, and portal hypertension in liver fibrosis in humans [9, 64]. Similar to clinical data, hepatic OPN expression is significantly increased and drives fibrogenic response in mice with various animal models including BDL, carbon tetrachloride or TAA treatment, and MCD, CDE or DDC diet [49, 65-67]. DNA hypomethylation of OPN enhancer during onset of early-stage liver fibrosis has been detected, which is confirmed to precede the up-regulation of OPN expression to induce the onset of fibrosis . Interestingly, transgenic mice overexpressing OPN in hepatocytes are able to develop spontaneous liver fibrosis over time (1 year) . During the pathogenesis of fibrosis, HSC-derived OPN interacts with αvβ3 on the HSCs to activate the PI3K/pAkt/NF-κB signaling cascade to up-regulate collagen-I and to modulate the HSC pro-fibrogenic phenotype . OPN also enhances ductular reaction and scarring in liver fibrotic mice and activates the oval cell compartment to differentiate to BECs, which then signals HSCs via OPN and TGFβ . In addition, OPN is up-regulated by oval cells in hepatic fibrotic patients and is confirmed to enhance viability and wound healing by modulating TGFβ signaling in cultured oval cells. OPN neutralization reverses epithelial-mesenchymal-transition (EMT) in oval cells and attenuates fibrogenesis in mouse model of liver fibrosis . Most recently, OPN is found to increase NADPH oxidase activity and inhibit histone deacetylases 1/2 promoting HMGB1 acetylation and translocation in HSCs, where then HMGB1 up-regulates collagen-I via RAGE and activates the PI3K-pAkt1/2/3 pathway . In general, the fibrogenic role of OPN in liver diseases has been confirmed via significant research over the years. However, targeting OPN for resolution of fibrosis still remains controversial due to its opposing effects on different pathological conditions of fibrosis as discussed above. The research for the relationship between OPN and HCC has been popular and studied intensively. OPN is markedly elevated in the plasma of HCC patients, and has been identified as a diagnostic biomarker that could also improve AFP performance in HCC surveillance among patients with HBV or HCV-related cirrhosis [13, 70]. OPN has good sensitivity in AFP-negative HCC, indicating OPN as a better marker in the early stage of HCC . OPN expression significantly correlates with clinicopathological features of HCC patients with HBV and/or HCV such as capsular infiltration, vascular invasion, lymph node metastasis and TNM stages [71, 72]. A study of Korean HBV-related cirrhosis and HCC has showed that genetic polymorphisms in the OPN gene are associated with HBV clearance and the age of HCC occurrence . Accordingly, the SNPs -156 and -443 of OPN are associated to susceptibility to HCC . Additionally, another study agreed that allele T/T and/or T/C rather than C/C at nt -443 not only significantly enhanced metastasis, but was also associated with overall survival and time to recurrence . Other than in HCC with HBV or HCV, OPN is not a useful diagnostic marker for HCC in alcoholic cirrhotic patients, particularly in the early stages, which limits OPN to become a significant diagnostic marker for HCC . Overexpression of OPN is found to lead to intrahepatic metastasis, early recurrence and poorer prognosis of surgically resected HCC [77, 78]. Similarly, OPN positive expression facilitates recurrence and reduces patient survival after liver transplantation for HCC . Therefore, OPN may be a useful marker for detecting early recurrence of HCC after surgery [80, 81]. OPN signals cell proliferation, EMT, invasion and metastasis in HCC. It mediates increase in cell proliferation depending on CD44, and a form of OPN-A exerts the greatest proliferative effect . In addition, OPN interacts with CD44 receptor to enhance HGF-induced scattering and invasion  and activates c-Met to promote HCC progress . The binding of secreted OPN from HCV-infected cells to integrinαvβ3 and CD44 leads to elevation of reactive oxygen species and activation of Ca2+ signaling and downstream cellular kinases such as MAPK, JNK, PI3K, FAK, and Src, all of which promote EMT, cell migration and invasion to enhance tumor progression and metastasis in HCC [85, 86]. OPN is also able to bind to vimentin and increase vimentin stability through inhibition of its protein degradation to improve EMT in HCC cells . On the other hand, OPN silence in HCC cells results in suppression of αv, β1 and β3 integrin expression, inhibition of NF-κB signaling activation, and blockade of Bcl-2/Bcl-xL and XIAP expression with increased Bax expression, thus inducing mitochondria-mediated apoptosis . Lentiviral-mediated miRNA against OPN induces a significant decrease in MMP-2 and uPA expression and leads to an obvious suppression of both in vitro invasion and in vivo metastasis of HCC cells . RNA aptamers against OPN binding markedly decrease EMT and HCC tumor growth . However, in a mouse model of DEN-induced hepatocarcinogenesis, intracellular OPN in macrophages interacts with the pivotal TLR signaling protein MyD88 to function as an endogenous negative regulator of TLR-mediated immune response to ameliorate production of pro-inflammatory cytokines, subsequently impeding liver carcinogenesis . Overall, OPN shows promise as a diagnostic marker for HCC, but further confirmation of its potential therapeutic value for HCC is urgently required. Since 2004, Terashi et al. reported that decreased expression of OPN is considered to be a reliable indicator for tumor aggressiveness in intrahepatic cholangiocarcinoma (ICC), and negative expression of OPN protein is significantly related to lymphatic permeation, perineural invasion, intrahepatic metasitasis and lymph node metastasis, leading to a lower overall survival . However, another study in 2013 had opposing views that stromal overexpression of OPN correlates with a poor diagnosis in patients with ICC, suggesting that OPN may be an independent prognostic marker for ICC . OPN exists in various hepatic cells including BECs, Kupffer cells, activated HSCs, NKT cells, injured hepatocytes and HCC cells. OPN is involved in hepatic inflammation after acute or chronic liver injury, ALD, NAFLD, fibrosis and cirrhosis (Fig. 2). OPN is also linked to liver repair. Large amounts of literatures shed light on the specific diagnostic and prognostic implication of OPN in HCC, mostly with HBV and HCV. Overall, OPN exacerbates the progression of liver diseases under most pathological conditions via interacting with αv integrin, CD44, vimentin or MyD88, which suggests OPN as an appropriate and desired therapeutic target against liver diseases. 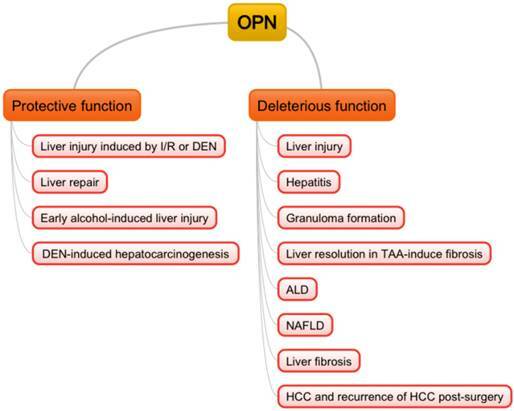 OPN regulation in liver diseases. In liver, OPN interacts with integrins to deteriorate the development of liver inflammation, injury and fibrogenesis. In carcinogenesis, OPN promotes proliferation, survival, migration, invasion, metastasis and EMT in HCC cells by binding to αv integrins, CD44 and vimentin. Otherwise, OPN binds to LPS or MyD88 to inhibit the progress of inflammation. 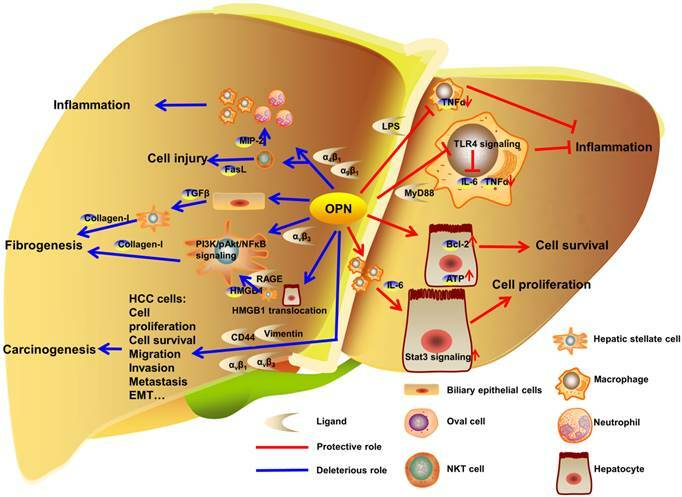 Besides, OPN protects hepatocytes from injury and facilitates hepatocytes proliferation in model of PHx. AFP: alpha-fetoprotein; AH: alcoholic hepatitis; ALD: alcoholic liver disease; ALF: acute liver failure; ALT: alanine aminotransferase; APAP: acetaminophen; ASH: alcoholic steatohepatitis; ATP: adenosine triphosphate; Bax: Bcl-2 associated X protein; Bcl: B-cell lymphoma; BDL: bile duct ligation; BEC: biliary epithelial cell; CDE: choline-deficient ethionine-supplemented; CHB: chronic hepatitis B; CHC: chronic hepatitis C; ConA: concanavalin A; CYP2A5: cytochrome P450, family 2, subfamily A, polypeptide 1; DC: dendritic cell; DDC: 3,5-diethoxycarbonyl-1,4-dihydrocollidine; DEN: diethylnitrosamine; EMT: epithelial-mesenchymal-transition; Eta: early T-lymphocyte activation-1;FAK: focal adhesion kinase; FOXO1: Forkhead box O1; HBV: hepatitis B virus; HCC: hepatocellular carcinoma; HCV: hepatitis C virus; HGF: hepatocyte growth factor; Hh: hedgehog; HMGB1: high-mobility group box-1; HSC: hepatic stellate cell; ICC: intrahepatic cholangiocarcinoma; IFN: interferon; IL: interleukin; iNOS: inducible nitric oxide synthase; IRS-2: insulin receptor substrate-2; I/R: ischemia/reperfusion; JNK: c-Jun N-terminal kinase; LPS: lipopolysaccharide; MAPK: mitogen-activated protein kinase; MCD: methionine-choline deficient; MMP: matrix metalloproteinase; MyD88: myeloid differentiation factor 88; NAFLD: nonalcoholic fatty liver disease; NASH: non-alcoholic steatohepatitis; NF-κB: nuclear factor-κB; NKT: natural killer T; OPN: osteopontin; PHx: partial hepatectomy; PI3K: phosphoinositide 3-kinase; RAGE: receptor for advanced glycation end-products; RGD: arginine-glycine-asparate; SLAYGLR: serine-leucine-alanine-tyrosine-glycine-leucine-arginine; SNP: single nucleotide polymorphism; Spp1: secreted phosphoprotein 1; Stat: signal transducer and activator of transcription; SVVYGLR: serine-valine-valine-typrosine-glycine-leucine-arginine; TAA: thioacetamide; TGF: transforming growth factor; TLR: Toll-like receptor; TNF: tumor necrosis factor; TNM: tumor-node-metastases; uPA: urokinase plasminogen activator;XIAP: X-linked inhibitor of apoptosis protein. This work was supported by the National Natural Science Foundation of China (31300742 to X Kong, 8147224 to Q Xia), and the Shanghai Education Committee (Eastern Scholar Program) and program from the Shanghai Key Laboratory of hepatocellular and cholangiocellular carcinomas (13DZ2261100) to X Kong, the Shanghai Health Bureau Key Joint Efforts Foundation (2013ZYJB001) to Q Xia.